Marie Dora “Doe” Thornburg died peacefully on May 25, 2018. Doe Thornburg (née Wettlaufer) was born in Boston on August 2, 1922, the eldest of eight siblings, all of whom preceded her in death. Doe attended Boston’s Northeastern University, Chandler Business School, and Malkin Conservatory where she studied voice and piano. Her upbringing was greatly influenced by her paternal grandmother who, on numerous occasions, took her to Europe to complete her education in the fashion of the Grand Tour. As World War II was beginning, Doe joined the Red Cross as one of its spokespersons and organizers. After Doe came to Chicago, she served on the Boards of the Lyric Opera Guild, Hull House, the Museum of Contemporary Art (Women’s Board), the American Cancer Society, International House, the International Visitors Center, and the Chicago Tourism Council, as well as on committees of Chicago Seminars on the Future and Know Your Chicago. For a number of years, Doe was National President of the English-Speaking Union. For her untiring efforts on behalf of this organization in improving the relations between Great Britain and the United States, she was honored by Queen Elizabeth II as a “motivator of people” and was made an officer in the Order of the British Empire (O.B.E.). IWA honored Doe in 2012 on the occasion of her 90th birthday by creating the IWA Doe Thornburg Scholarship. The purpose of the scholarship is to invest in students so that they become engaged global citizens. Doe believed that there is no better way to understand a different culture than to have direct interaction with that culture. For this reason, the scholarship was created to help female college students pursue their dream of studying abroad. 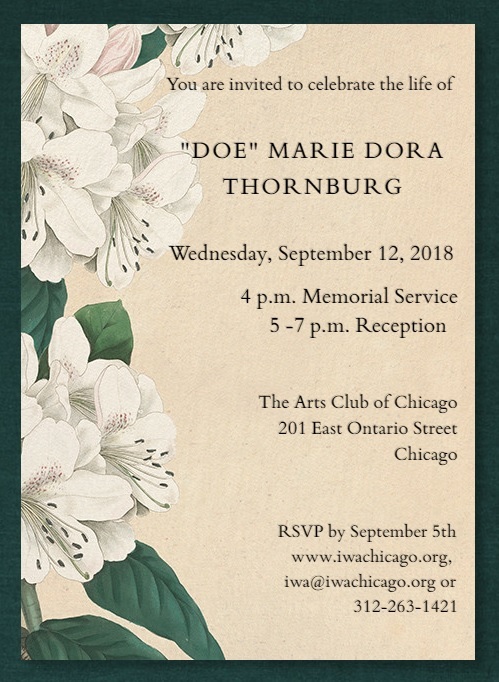 To date, the IWA Doe Thornburg Scholarship is offered at Columbia College, Northwestern University, School of the Art Institute and University of Illinois at Chicago. Doe was “one in a million,” a truly remarkable individual in spirit and physicality right up until the end. She had a beautiful smile, exuded an elegant sense of style and lived an engaged, purposeful life. In 1972 Doe married Robert Thornburg, owner and director of Thornburg Clinical Laboratory, who died in 1997. In “Bob” she met her soul mate. She is survived by seven nieces and nephews: Catherine Wettlaufer Buehler (Jay), Robert Alan Doonan (Becky), Suzanne Marie Doonan, Andrew David Doonan (Sherron), William Lyons Doonan, Rear Admiral Michael Wettlaufer (Tina), and Professor John S. Wettlaufer (Ulrika) and their children, as well as by her cousins. She is also survived by stepdaughter Carol Kathleen Thornburg and stepson David Thornburg (Norma). Doe will be interred in her family burial plot in Massachusetts during a private family service in the fall. In lieu of flowers, contributions may be made to the IWA Doe Thornburg Scholarship Fund, in care of International Women Associates, 307 N Michigan Avenue, Suite 702, Chicago, IL 60601, 312-263-1421 or online at www.iwachicago.org. A celebration of life service was held at The Arts Club of Chicago from 4-7 p.m. on September 12, 2018.